Tomas Chen struggles to walk after returning to Monte Olivo. Chen was beaten unconscious and arrested during the August 14, 2014 attacks. 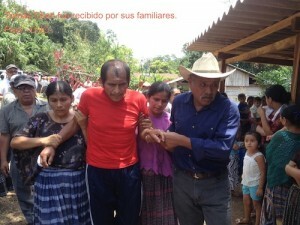 On August 27, five leaders from the community Monte Olivo were released from prison. The GSP joins Monte Olivo in thanking those who have taken action in solidarity with the community. We believe that phone calls and emails we helped generate played a small role in winning their freedom. The main reason they are free is the courageous protests of thousands of peasant leaders throughout Guatemala. This included nonviolent action in Panzos, Coban, La Tinta, El Estor and other parts of the country. Community and family members are joyful that their loved ones have returned home. However they continue to live in constant terror, facing continued threats by the government. Many members of the community are still suffering from serious injuries resulting from attacks. Please consider donating to the GSP to help injured community members acquire medical treatment. 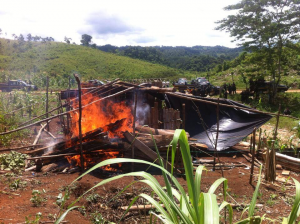 Police and paramilitaries burned down many homes and stole peasant’s possessions during the attacks. 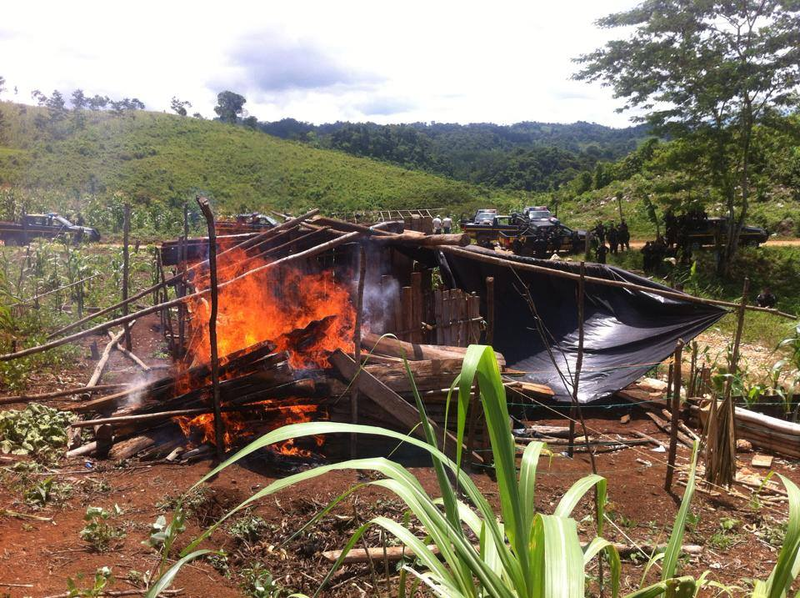 The GSP urgently requests solidarity after over 1,000 police and paramilitaries attacked several q’eqchi’ communities in Alta Verapaz, Guatemala. The attacks began on August 14 and included the extrajudicial execution of three community leaders, injuries to dozens of children, arrests of community leaders and destruction of houses. We are extremely concerned about the treatment of those arrested. We know that other indigenous leaders in the region who have been arrested in recent months were later tortured. We are also particularly concerned about children, pregnant women and the elderly. We have seen several people starve to death after similar attacks on other communities. We urgently request donations, phone calls and emails in solidarity with the repressed communities. Contributions can be made through our website. All funds go directly to our partners and will not be used for GSP staff or office costs. Communities are currently prioritizing funds for those wounded in attacks and to support prisoners. If you speak Spanish please contact Coban Mayor Leonel Chacon at (country code 011 502) 7955 3232 or chaconbarrios@gmail.com, Alta Verapaz governor Ronald Ramiro Sierra López at 7952 1369, 7951 4311 or goberaltaverapaz@gmail.com, and Minister of the Interior Mauricio López Bonilla at mlbonilla@mingob.gob.gt. Please also call your US Representative. Under President and US Army School of the Americas graduate Otto Perez Molina, Guatemala continues to receive significant police and military training and hundreds of millions of dollars in “aid” annually. Please request an immediate end to violence against Monte Olivo and surrounding communities and the release of all political prisoners. The attacks targeted indigenous peasant communities and leaders who have organized against the destruction of Mother Earth for the profit of multinational energy companies. One of the central targets was Monte Olivo, one of the communities the GSP is seeking to build long term solidarity with. In 2008, the Guatemalan government gave Hidro Santa Rita, S.A. license to build a dam that would flood parts of dozens of q’eqchi’ communities. This was done without consulting communities, despite laws requiring such consult. In 2010 over 20 communities held official assemblies and demonstrated their opposition to the project. Despite being promoted as a “clean energy project,” the dam would actually cause massive pollution and irreparable damage to the local ecosystem. Its purpose would be to turn local natural resources into electricity that could be sold on the international market. It would force local indigenous communities deeper into poverty and create greater wealth for a small number of already wealthy individuals and companies. It would promote continued overconsumption and materialism that is in large part the cause of global warming. In February 2012, the government and company ignored the will of the people and began construction of the dam. The communities responded with various protests, and the construction stopped. On March 18, 2012, thousands of peasants from the region began the several hundred mile Indigenous and Peasant Popular March to Guatemala City, demanding justice and an end to government repression. Taking advantage of the absence of many indigenous and peasant leaders, the military invaded Monte Olive on March 22 and set up a military base in the community. After continued protests, the military withdrew in late April, 2012. In August of 2012 the communities delivered formal petitions to the mayor requesting that environmental and community impact studies take place before dam construction begin. The mayor instead responded by cutting the communities from the municipal budget. The communities continued to organize against the project, and in January 2013, arrest warrants were ordered against community leaders. On August 14, 2013, community leader David Chen escaped from an attempted assassination. On August 23 Chen met with representatives of the United Nations about repression against the communities. During the meeting, the company sent an agent to threaten Chen’s family. His 11 and 13 year old nephews were murdered. Attacks against the community in November and December left several minors severely wounded, and one young man was left paralyzed.